Matthew Apgar - mapgar@shawmedia.com Kim Schure of Darien and Vicki Lantz of Lombard. 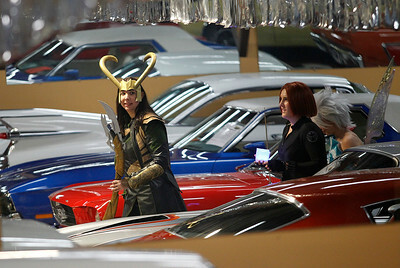 portraying the Marvel characters Loki and Black Widow respectively, are reflected in a mirror as they walk through a showroom full of classic cars during a "Night At The Museum" event on Friday, April 3, 2015 at Volo Auto Museum in Volo. The event was put on with help from the midwest chapter of Costumers With A Cause. 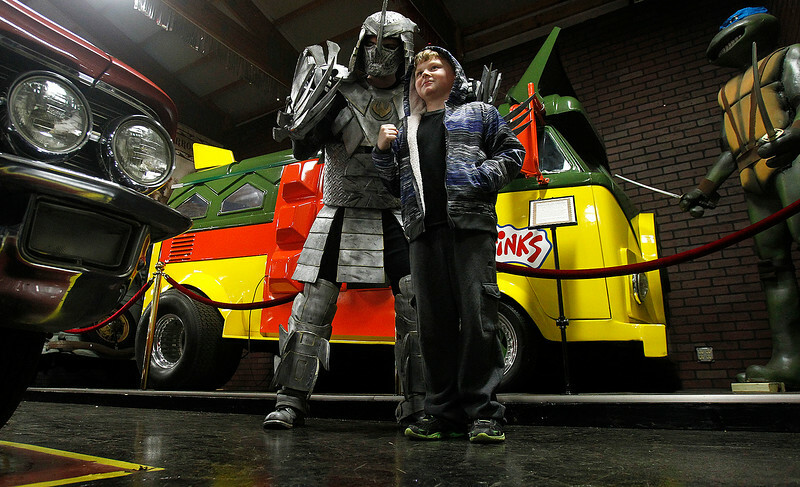 Matthew Apgar - mapgar@shawmedia.com Jayden Doherty of McHenry, 9. poses for a photo for his mom with John Quade of Dekalb, portraying the Teenage Mutant Ninja Turtles villain "Shredder", near the superheros' vehicle during a "Night At The Museum" event on Friday, April 3, 2015 at Volo Auto Museum in Volo. 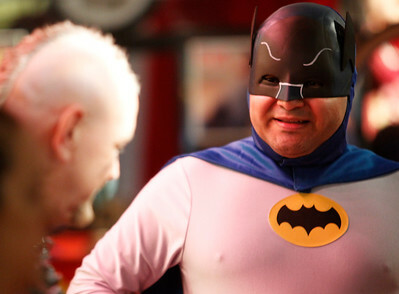 The event was put on with help from the midwest chapter of Costumers With A Cause. Matthew Apgar - mapgar@shawmedia.com Spectators check out the automobiles and costumed characters during a "Night At The Museum" event on Friday, April 3, 2015 at Volo Auto Museum in Volo. The event was put on with help from the midwest chapter of Costumers With A Cause. 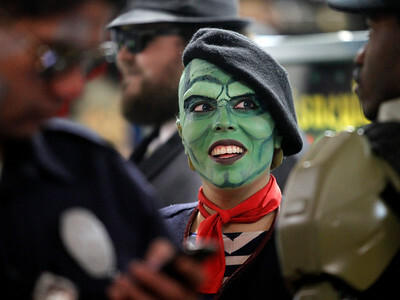 Matthew Apgar - mapgar@shawmedia.com Luisa Gonzalez of Chicago, portraying Jim Carrey's persona in "The Mask", talks with other costumed characters during a "Night At The Museum" event on Friday, April 3, 2015 at Volo Auto Museum in Volo. The event was put on with help from the midwest chapter of Costumers With A Cause. Jayden Doherty of McHenry, 9. poses for a photo for his mom with John Quade of Dekalb, portraying the Teenage Mutant Ninja Turtles villain "Shredder", near the superheros' vehicle during a "Night At The Museum" event on Friday, April 3, 2015 at Volo Auto Museum in Volo. The event was put on with help from the midwest chapter of Costumers With A Cause.